The 46SV685DB is Toshiba's debut LED-backlit television, a variant on traditional LCD that is fast-becoming commonplace and is the entry level model of the SV range of Toshiba's Regza TVs. With its £2,500 price tag, it feels like a shift in focus for the brand. Is it trying to find a spot in the market away from the likes of Samsung and Sony? Unlike those manufacturers who have used LEDs at the edges of screens, allowing the TVs to be superthin, Toshiba has opted to stick with rear-mounted LEDs and local-dimming technology for its SV series. For those who don't know, local dimming allows clusters of LEDs to be independently controlled, meaning the screen can keep portions of the image bright while cutting the lighting on other parts. This makes the gulf between a TV's brightest and darkest limits far wider than possible using standard lamps. 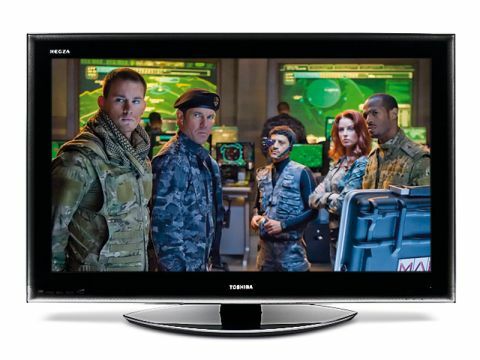 Toshiba has put the tech to good effect – the picture quality of the 46SV685 is absolutely stonking. It's not the skinniest or most attractive screen around, but from a performance perspective it's immensely impressive. Hook up a Blu-ray player and you'll immediately see the improvement in contrast over a regular LCD television. Whacking on the first part of Steven Soderbergh's epic biopic Che, I noticed straight away that the black parts of the screen during the scene-setting map animation were almost totally, well, black – while the movie in the middle remained vivid and vibrant. Even the most accomplished of standard LCD TVs struggle to make black look black while giving the rest of the image – the bits that should be bright – real depth, but that's not an issue for the 46SV685. This ability to deliver both deep, dark blacks and bright whites carries over into everything you watch, of course. The new Pro Evolution Soccer title for the PS3 looks utterly gorgeous; the pitch is rendered a lush, deep green while bright, white-shirted players all but leap off the screen. Contrast is at its best when you're sitting directly face-on to the screen. Move just a little to the left or right and the black levels drop off. Killer contrast is only one feather in the 46SV685's cap, another is Toshiba's Resolution+ processing, which upscales the source image to deliver what Tosh claims is a 'near HD' standard-def picture. It works well, enhancing the edges and generally sharpening up anything you chuck at it – even HD material and video games get a noticeable detail boost. Toshiba has been generous with its features and specification; alongside the four HDMI inputs is a wealth of multimedia compatibility, with an SD card slot, USB port and Ethernet connection allowing access to digital music, photo and movie files without the need to connect a separate source. I would never recommend a TV as a music source – even though the TV's built-in speakers are surprisingly good at creating a dynamic, full-bodied sound – but it's fine for photo slideshows and copes well with DivX-encoded videos. This is a mightily impressive screen that will improve almost anyone's home entertainment setup, but the 46SV685's asking price certainly isn't going to fall into everyone's budget. It's very expensive, to be honest, but I can see that price tag falling sharply in the coming months.